Melbourne Spring Fashion Week (MSFW) draws out many young and emerging talents looking to carve their name in the fashion scene as well as associated platforms for such designers to showcase their creations. 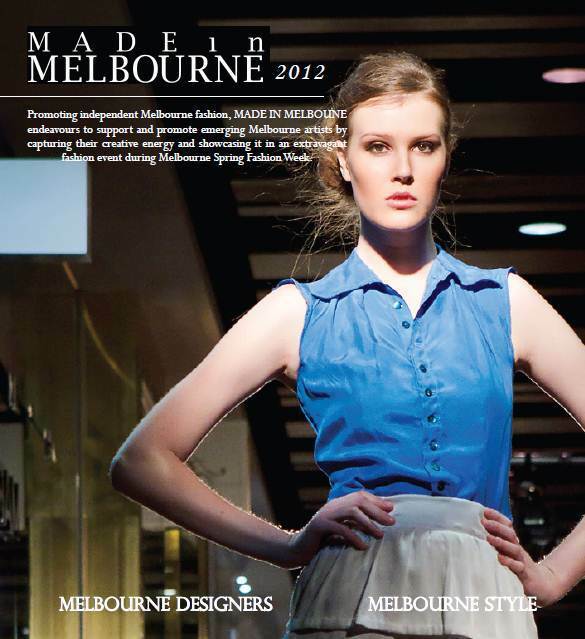 One such platform that makes Lionel's Melbourne a fertile ground for future designers is Made In Melbourne (MIM). Launched in 2009 during MSFW and now in its 4th year, MIM is a champion for young and emerging Melbourne fashion. It promotes independent Melbourne fashion designers alongside the MSFW main events. I managed to catch up with the gang of 4 behind MIM to find what makes them tick and more about what MIM brings to Melbourne's fashion scene. Russia-born Katya Baxter was the original mastermind for the MIM runway show. She came to Melbourne as a child and sewed, knitted and painted her way to a degree. While working in the fashion industry, she was driven to help people look past the big brand names and appreciate what unique local brands could offer. Katya came across budding labels and designers like Mina & Katusha, left out of the main MSFW programs and decided to create a runway show platform where excluded talent had a chance to shine in 2009. The following year, team member no. 2 and 3 came along in the form of Patrick Price and Jamie Li who both shared Katya's vision of helping emerging artistes find their big break in a very tough industry. Patrick is a native Melburnian who has travelled to world but still calls Melbourne home. A qualified teacher, he continued to dabble in the fashion industry to feed his creative soul. Young, well-travelled and business savvy Jamie is a keen photographer with commercial interest in arts and graphic design. On the back of his successes, he was keen to give back to the creative community and help other. In late 2010, Patrick and Jamie teamed up for FJORDE MAGAZINE with the objective of providing an outlet for creative disciplines including fashion, music and art to be seen and heard. The trio partnered to take MIM to the next level. Chloë Wedgwood is the most recent addition, bringing over 10 years of marketing, PR, event and media expertise gained helping small-to-medium size companies achieve the maximum bang on a limited budget. Her experience with MIM was in 2010 when working with a client and again in 2011 as a corporate sponsor. Originally from UK, she now calls Melbourne home. Melbourne has long been considered the style centre of Australia and upholds the reputation as one of the most creative cities in the world. This gang of 4 seek to capture this creative energy and showcase it to a broader public audience and members of industry through MIM. Their efforts are paying off as MIM is fast becoming one of MSFW's standout events. Growing steadily with an audience of just 80 in 2009, MIM was a sell-out event of over 450 in the previous 2 years. This year MIM will be presenting up-and-coming Victorian designers including Tai & Amaya, Stella Blanche, Sleep'n Round, Mina & Katusha, Lisa Taranto, Cadelle Leather, Kathryn Beker at the Showtime Event Centre during MSFW. In addition to featuring these emerging local talents, this year's program will also provide attendees with the exclusive opportunity to purchase garments seen on the runway at discounted prices through their mobile phones. Using a unique QR code, attendees can purchase what they like by simply scanning the code with their phone and complete their purchase at a specially set up online store. By adding this element of technology, the team at MIM are allowing designers to interact directly with their market and visa versa.